If you’re from Britain then travelling in the Eurozone can be quite expensive given the current exchange rate – a disadvantageous €1.13 = £1 at the time of writing. Since this makes chocolate gold coins worth more than sterling on the continent, eating three square meals while you’re sunning yourself on holiday is potentially quite expensive. That doesn’t have to be the case though as I found out when hunting for cheap breakfasts during my recent trip to Madrid. Here’s an overview of places where you can have breakfast for €5 or less. If you have suggestions of your own, then let me know in the comments! This Madrid institution is more than a century old and is probably mentioned in all the Madrid guide books since the place was rammed with tourists on both of my early morning visits. Although a handful of other pastries are also available, the focus here is definitely on churros – deep fried dough sticks served with dipping chocolate. This may seem like an odd breakfast food from a gringo point of view, but the locals don’t seem to mind so why should I? 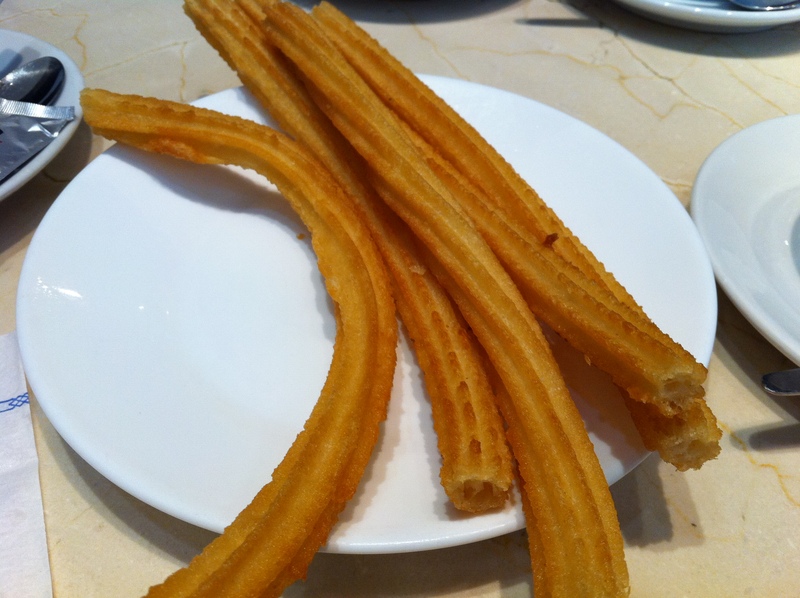 The churros themselves are available in either thick or extra thick versions. They’re very oily, but the gearhead shape helps the chocolate cling to the pastry which is also quite absorbent, soaking up the chocolate quite well. The chocolate itself is thick, dark and bittersweet with an odd aftertaste that I can’t quite place, but is best described as malty. The café con leche (coffee with milk) is reasonably strong, but tastes a bit bitter which isn’t to my taste. Service varies from brusque and efficient to brusque and useless, but considering this is just a pitstop and not a place to linger, I can forgive that to a certain extent. The place is also open until the wee, wee hours of the morning which, combined with its central location, makes it a good place to line your stomach with oily dough after a hard night of drinking. What is that odd taste in my mouth? San Ginés isn’t a bad introduction to the joy of churros, but given the hordes of tourists, the queues and the slightly iffy quality of the churros and chocolate, I probably wouldn’t return the next time I was in Madrid. The imaginatively-named Chocolate Y Churros (the Y is Spanish for ‘and’ apparently) also serves churros. While San Ginés has an old world tiled floor and mirrors look, Chocolate Y Churros resembles an American corporate coffee chain with bland, inoffensive beige decor. The service is better though – they actually acknowledge your existence most of the time, which can’t be taken for granted at San Ginés. One nice touch is that you can see the kitchen from some tables, where you can view the poor woman tasked with hand making an endless supply of churros. Surprisingly, the chocolate tastes almost exactly the same as the chocolate at San Ginés suggesting that they source chocolate from the same source. The churros is thinner, but considerably less oily though not oil free. It has the same gearhead shape so it soaks up and holds the chocolate dipping sauce well. It’s odd how watching someone make something makes you appreciate it all the more. 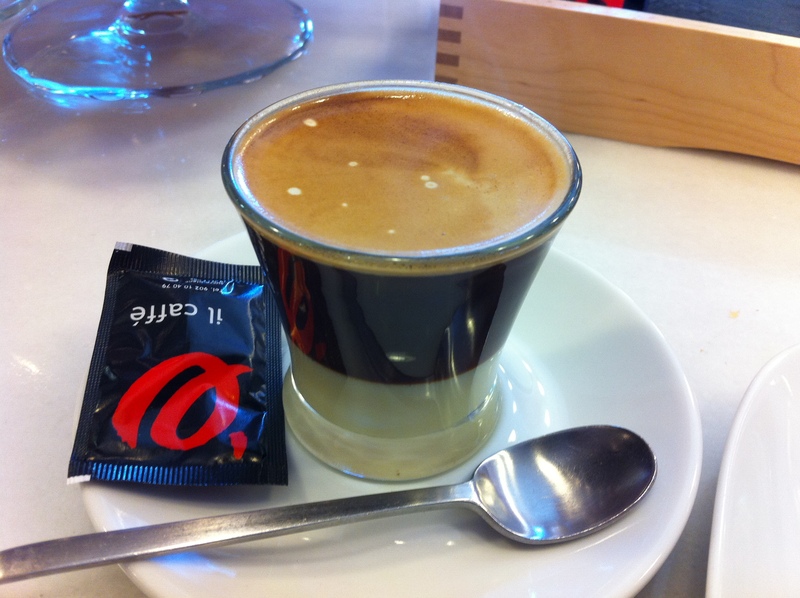 Sadly the café con leche is both weak and bland – the espresso isn’t much better. 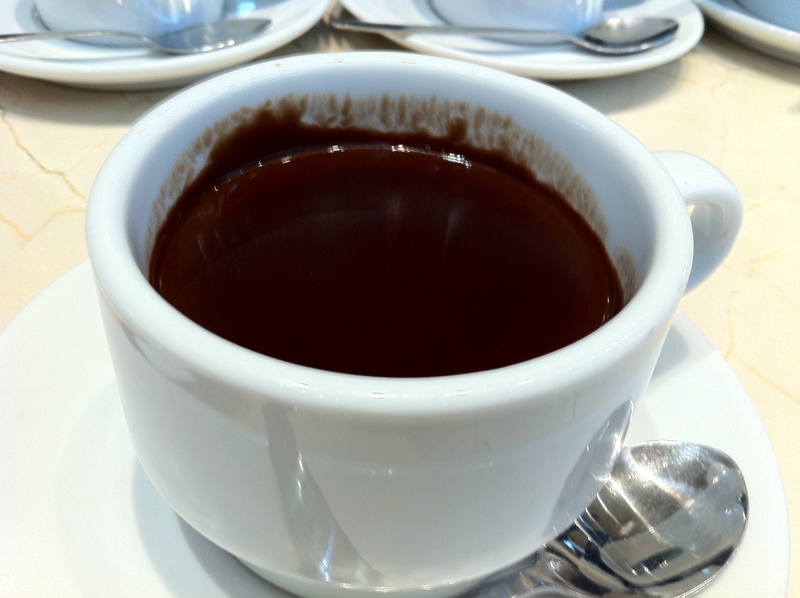 A more flavoursome coffee is the café bombon which is made with condensed milk. It tastes much like Vietnamese-style condensed milk coffees, but with an unusual layered appearance. It’s still not particularly strong, so if you’re a hardened caffeine addict like me, then you may want two. Or three. Chocolate Y Churros also serves other types of pastries including, at Easter time, torrija which is apparently a traditional Spanish Easter-time treat. 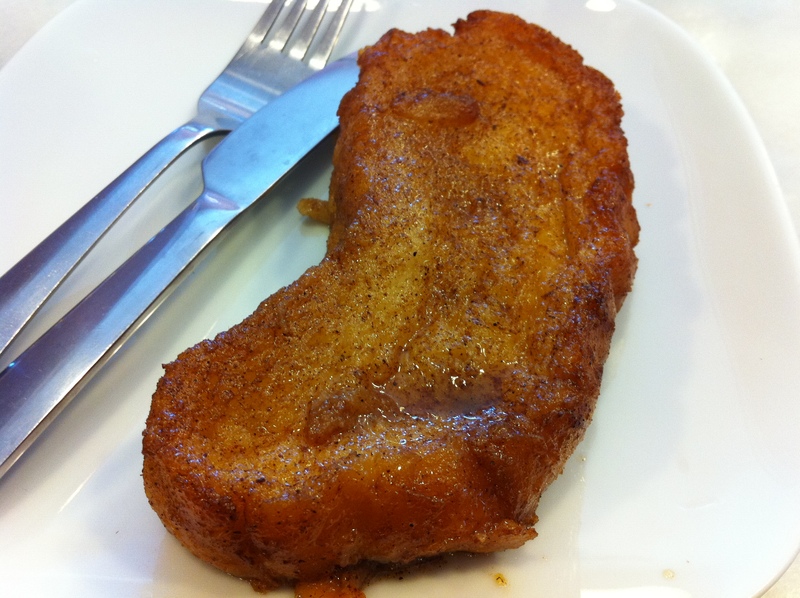 This cinnamon-flavoured delight was soft, creamy and very fluffy with an almost creme brûlée-like texture. Superb – too bad it only seems to be available around Easter. 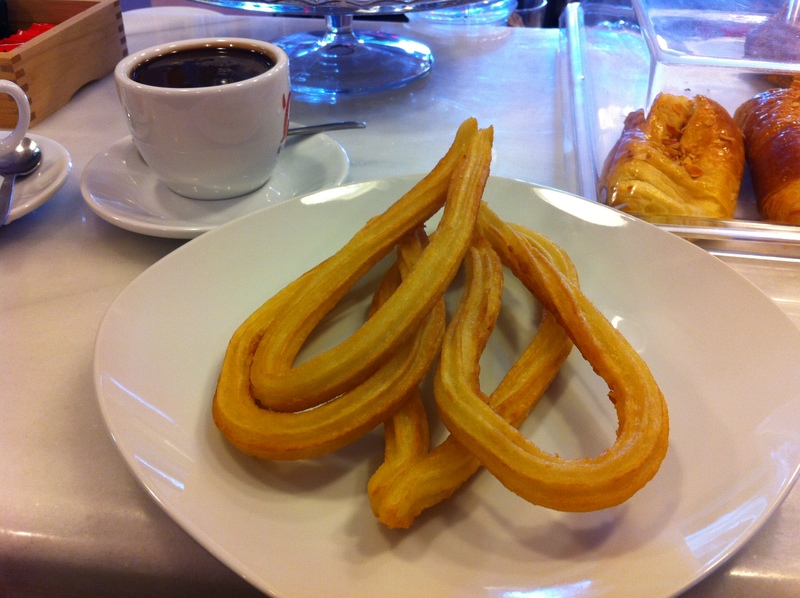 Chocolate Y Churros is a better bet for churros than the Chocolateria San Ginés, but the other pastries are far more interesting. The coffee could do with more vavavoom though. 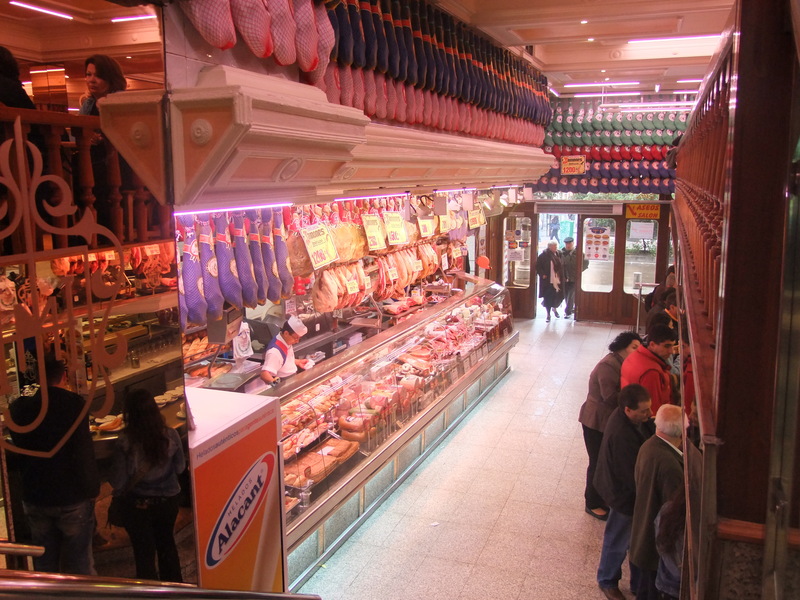 This slightly odd chain of eateries has half-a-dozen outposts throughout Madrid and combines a fast food-style restaurant with a staggering array of cured meats to buy deli-style. The sight of all those hams is certainly a sight to behold. The €1 café con leche is strong, if a bit bland. The real highlight is the menú del día, or menu of the day. 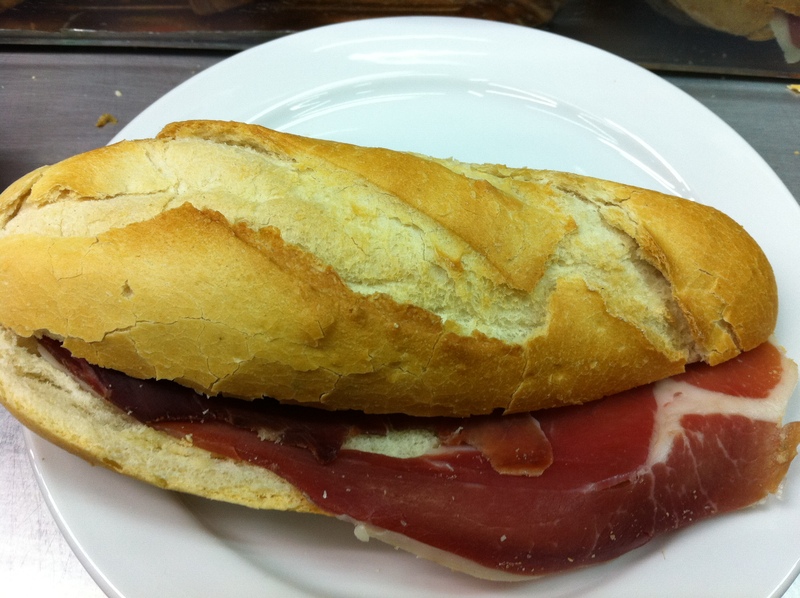 A jamón baguette or a jamón and emmental croissant are just €1 each. The bread and cheese are fine, but the quality of the meat isn’t anything to write home about. Still for just €1 it would be churlish to complain. More substantial lunchtime and dinnertime meals are also available. Surely the best value breakfast in Madrid? Neither croissants or emmental cheese are Spanish, but at €1 I don’t care that much. Meat and bread. What more do you want? This last breakfast pitstop is a little different since it’s actually a covered market set inside a lovely ironwork structure dating from 1916. 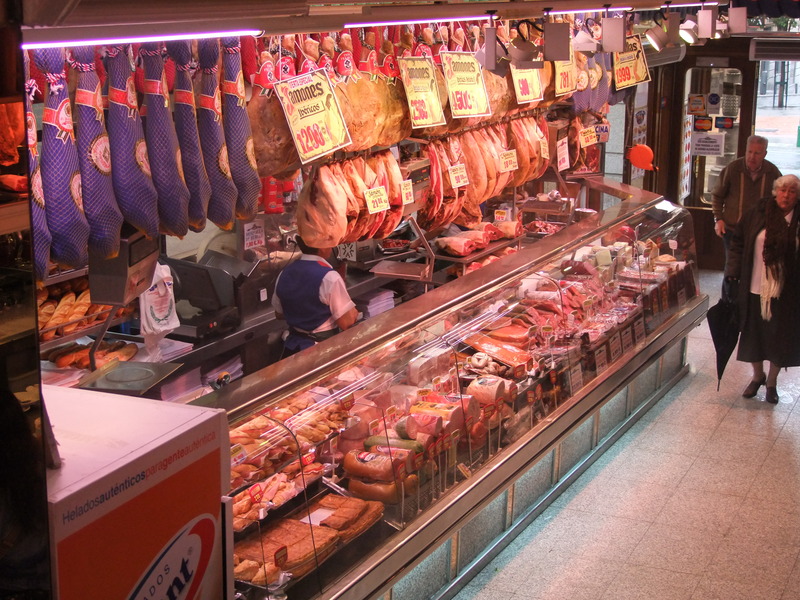 There are numerous stands inside selling everything from pastries, tapas, Hungarian sausages and jamón sandwiches to fresh seafood. Think of it as a very small Borough Market with a handful of tables and you’ve got the right idea. 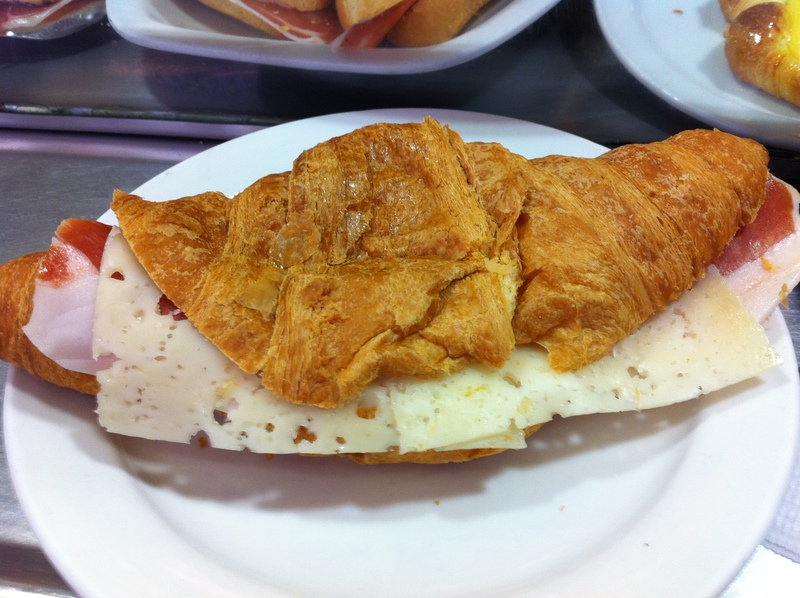 Prices can therefore vary wildly, but a jamón sandwich or a marzipan pastry with a café con leche can be had for just under €5. Given the varied nature of the Mercado San Miguel, it wouldn’t be fair to give it a star rating, but it’s well worth dropping by. The place doesn’t open until 10am though, so it’s not for early risers. Opening hours: Monday-Wednesday and Sundays: 10.00-midnight. Thursday-Saturday: 10.00-02.00. 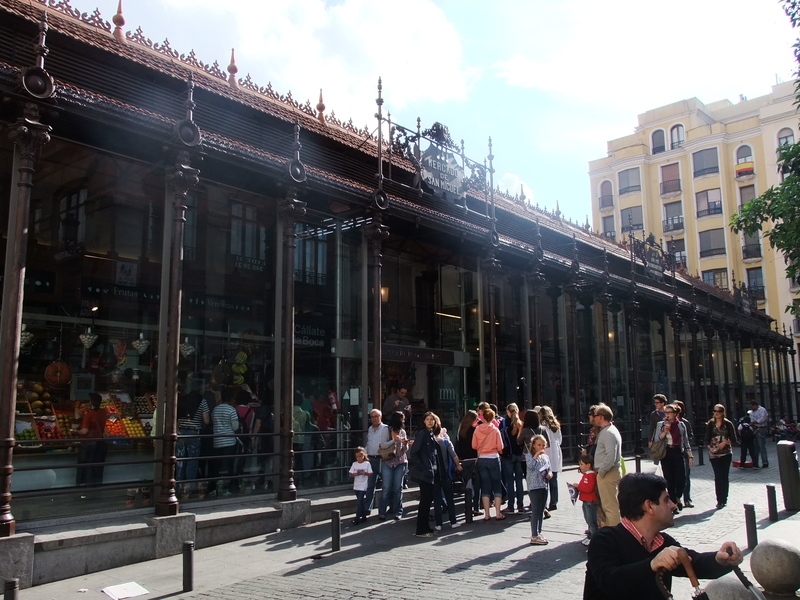 Tags: baguette, breakfast, cafe bombon, chocolate, chocolate y churros, Chocolateria San Ginés, churros, coffee, condensed milk, croissant, emmental, jamon, madrid, market, mercado san miguel, restaurant, review, spain, torrija. Bookmark the permalink. Thank you very much for this! I have a 6am arrival in MAD with a 6 hour layor. Was looking for breakfast ideas.